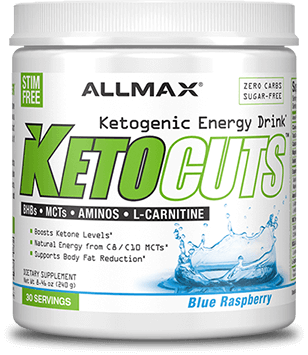 KETOCUTS also contains vital electrolytes that any Ketogenic dieter knows is essential for the body to function at peak performance. After an intense workout it’s important to fuel the body with Sodium and Magnesium for proper muscle function. * They also help stimulate the enzymes that metabolize ketones. 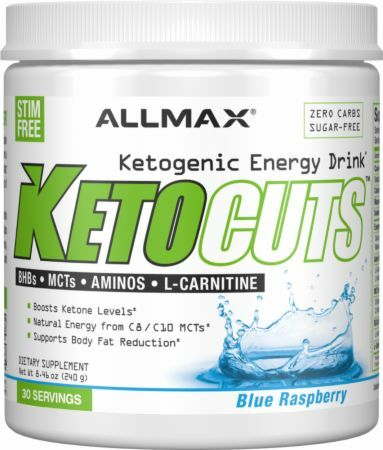 * To further support recovery KETOCUTS has a solid dose of BCAAs and essential amino acids. With two delicious and refreshing flavors to choose from KETOCUTS makes it easy to help boost your Ketogenic game! Citric Acid, Natural and Artificial Flavors, Sodium Caseinate (Milk), Sucralose, Calcium Silicate, Acesulfame Potassium, Silica, Lecithin (from Sunflower), FD&C Blue #1. ALLERGEN WARNING: Produced in a facility that also handles Soy, Egg, Tree Nut, Peanuts, Fish and Shellfish products. Directions For KetoCuts: Enjoy 1-2 scoops of KetoCuts™ any time of day. For each rounded scoop (8 g), add 180-240 mL (6-8 oz) of water. Works best after a meal in the morning and evening and 20-30 minutes before a workout. Warnings: Not for use by individuals under the age of 18 years. Ensure you drink enough fluid before, during, and after exercise. Consult a health care practitioner, you are pregnant or breastfeeding, you have any known or suspected medical conditions, you are taking any prescription or OTC medications, or you experience any adverse reactions. Do not use if inner seal is broken. Store in a cool, dry place and keep out of direct sunlight. Keep out of reach of children.